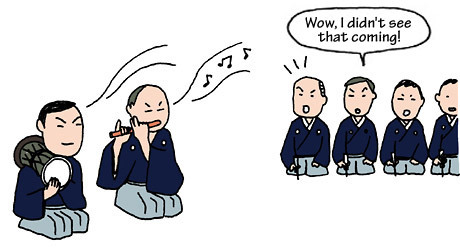 TRIVIA of Noh : Q79 : Is an ad lib a result of the performance? | Home | Trivia | Q79 : Is an ad lib a result of the performance? Is an ad lib a result of the performance? Noh musicians have scores, and actors have librettos. A Noh performance is a combination of the two different types of notated expression that move forward together on a single stage. Although Noh plays do not involve stage managers, directors or conductors, the chanting and music are well integrated. One of the reasons for this integration is that both actors and musicians perform in time with the performance of the others, in the rhythm called hyōshi-ai (in harmonized measures). Another type of the rhythm, called hyōshi-awazu (in disharmonized measures), in which actors and musicians deliberately disorder the time, also plays an important role in the integration of each part. In hyōshi-awazu, the leading, accompanying and supporting actors and the chorus chant to express the meaning of the play with a sense of the essential concept jo-ha-kyū (beginning slowly, speeding up, and ending swiftly). The musicians play in irregular meter while keeping the basic eight-beat time. The procedure is called mi-hakarau (judging the right time). The musicians, however, are not playing strictly to the speed of chanting, or vice versa. The combination of the freely realised expressions of each player will together create a single ad lib. When the expressions fit together well, the effect is indescribably profound.